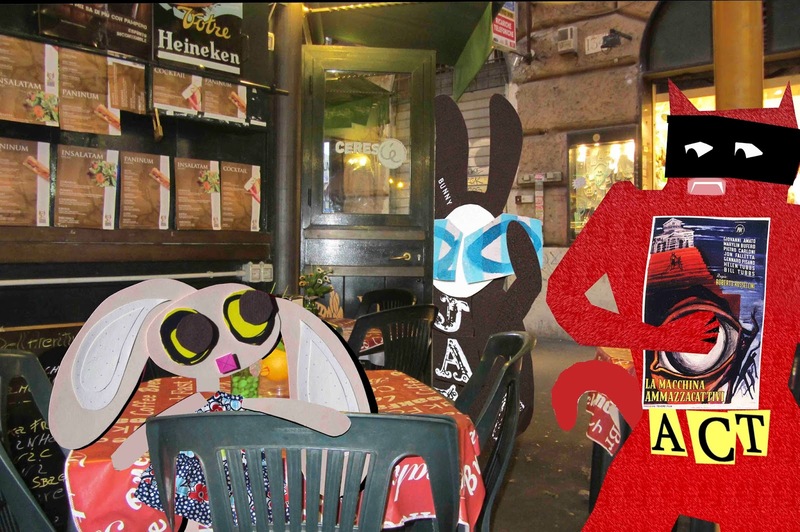 The Wabbit tracked Skratch and Lapinette to a kiosk that catered for the soccer crowd. "Aha!" he murmured to himself. "I thought I'd never find the place." Skratch was delivering some kind of lecture with Lapinette in rapt attention. It was a lecture so passionate he'd heard it from the corner. "I'll ask the question!" interrupted the Wabbit. "So what was that for a gloomy sort of adventure?" Skratch turned and smiled. "I found it optimistic, Wabbit." Lapinette's paw hung artfully from the back of a chair. "I know exactly," she breathed. "It was a neo realist adventure." She paused for effect. "The camera is an idiot. It's what in front of it that counts." The Wabbit stared at Skratch. Skratch stretched and placed a paw across his chest. "Rossellini said that recognition of evil was a sign of hope." The Wabbit cast a scathing glance at the menu. "Then I hope there's a better caffè across the road." Everyone laughed. Lapinette stood and Skratch pulled back her chair. "Rossellini preferred not to work from a script," he purred. "Just like us," chirped the Wabbit. He made a move to leave, but Skratch wouldn't stop talking. "Rossellini used real people, not professional actors." "Just as we do!" repeated the Wabbit. "One more thing," said Skratch, "neo realism wasn't a genre. It was a cultural movement." Lapinette looked at the Wabbit and spoke in a husky Ingrid Bergman voice. "And so are we."